Home » Afflict vs. Inflict – What’s the Difference? If someone stabs you with a knife, did they afflict you with a wound, or inflict a wound on you? On the other hand, when you catch a cold, are you inflicted by a virus, or afflicted with one? Many writers aren’t sure how to use inflict and afflict correctly, and today I want to discuss how to use these two verbs. What is the Difference Between Afflict and Inflict? In this post, I will compare afflict vs. afflict. I will use each of these words in at least one example sentence, so you can see them in context. Plus, I will show you a useful memory tool to help you remember whether the afflict or inflict is the verb you seek. What does afflict mean? Afflict is a verb that means to be caused trouble or harm. Afflict is usually used with an object preceded by the preposition with, so that a person is afflicted with something—a disease, a sickness, a mental problem. While on vacation, I was afflicted with food poisoning. The entire city was afflicted with malaria during the unusually wet summer. “I would love to turn traitor, but alas, I am afflicted with a sense of duty to my country,” said the prisoner. What does inflict mean? The verb inflict means to cause trouble or harm. Inflict is a transitive verb; it is always used with an object, and it takes the preposition on. The knights inflicted wounds on each other with their lances. “My power attack inflicts 9,000 damage!” screamed the excited gamer. “Your words inflict pain upon my broken heart,” murmured John’s scorned former lover. Nonliving things, such as scourges, punishments, taxes, regulations, etc., are inflicted on someone or something. Now, let’s go over a trick to remember inflict vs. afflict. Afflict and atherosclerosis both begin with the letter A. Since afflict is only used with diseases and other maladies, you can use the shared original letter between afflict and atherosclerosis to remind yourself of this verb’s appropriate usage. Is it inflict or afflict? 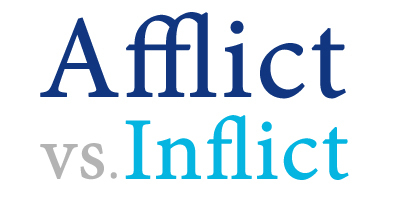 Inflict and afflict are two verbs that are so similar that it is easy to confuse them. Inflict means to cause harm or trouble. Afflict means to be caused harm or trouble by something, usually a disease. The two words appear similar and have related meanings, but they are used in specific ways. Since afflict is used with diseases, remember that it and atherosclerosis, a type of disease, both begin with the letter A.
Nuances in meaning and usage can make similar verbs difficult to differentiate. Don’t forget, you can always check this site when you have questions about confusing words and other writing topics. 1 What is the Difference Between Afflict and Inflict? Illegible vs. Unreadable – What’s the Difference?